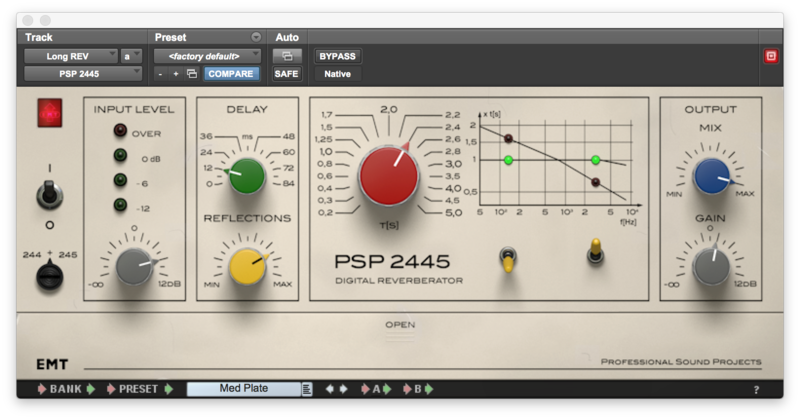 PSP 2445, Software algorithmic reverb from PSP Audioware. 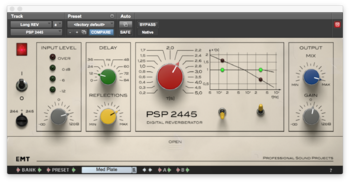 With the release of version 1.2 of its 2445 reverb, PSP now has the official blessing of EMT, the company that made the outboard reverb units modeled in this plug-in. We figured that was a good reason to take this baby for a test drive. 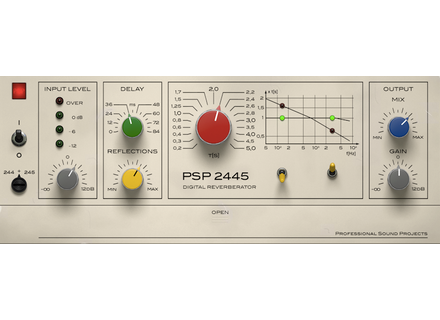 The PSP 2445 features dual reverb engines, the 244 and 245, each an emulation of EMT’s outboard digital reverberators of the same name. The 244 was released in the late ‘70s, and the 245 in the early ’80s. The units were simplified versions of the flagship of this line of reverb units, the EMT 250. The 245 offered more parameters than the 244, and PSP has added some additional controls. The plug-in runs on AU, VST, AAX and RTAS for Mac, and VST, AAX and RTAS for Windows. It allows you to use either the 244 or 245 algorithm separately, or run them both together. You can also alter the order in which the signal goes through the algorithms when using both. Let’s take a look at the various controls offered. On the far left, in addition to the on/off switch, you have a switch for controlling which algorithm you’re using — 244, 245, or both together. Next is the Input Level knob, which has a 4-step LED-ladder-style meter above it. The next section features a Delay control (pre-delay), a 14-step knob which goes from 0 to 84ms. I would have liked an option to enter a numeric value from the keyboard, so that you could get precisely the setting you wanted based on your song tempo, rather than being stuck with one of the 14 choices. Below is the Reflections knob, which lets you dial in the amount of early reflections that you want. The more you turn it up, the more early reflections are mixed in with the reverb tail in the signal. Higher settings yield a more dense sound. The large red knob controls reverb time, and it’s also stepped, allowing you to go from an ultra-short setting of 0.2 seconds to an ultra-long setting of 5.0 seconds. The Low-Frequency Time switch sets extended or normal low frequency decay and the High-Frequency Time switch sets a normal or reduced decay time for high frequency. The manual, which is otherwise pretty good, could be a lot more explanatory about how these switches work. The decay times of high- and low-frequency signal can be further adjusted by High and Low knobs while the High Pass Filter removes unnecessary low end. These are hidden until you open “the Flap,” by clicking on the word "Open" below the product name in the center. Also in the Flap is another switch for selecting the algorithm, a Mod Multiplier knob, which sets the modulation depth as well as stereo Width and stereo Balance knobs. The very bottom of the GUI offers preset and bank management including a dropdown of the factory presets. I was a tad disappointed that there were only 32 presets — I thought more could have been offered to cover more types of sources. Although the presets don't include separate versions for Aux and Insert applications, the Mix control knob maintains its value when you switch presets, so if you're, say, wanting to step through a number of presets for use on an aux bus, it's easy to do, because you don't have to keep resetting the Mix control. I was very impressed with the sounds of the 2445. I never had experience with the original hardware units, so I can’t offer an opinion on how well the plug-in matches up with them. However, EMT likes it enough to give it their official endorsement, so I would surmise that PSP nailed it. From my own listening, I can tell you that it sounds really good. It’s pretty versatile, too, offering everything from authentic-sounding plate reverbs to really short rooms and long, slow-decaying spaces. Both the long and short settings sound consistently good. Here’s a vocal with a long 2.8 second reverb time, with the reverb applied from an aux bus. Listen to how good the tail sounds as it decays. Now here it is on guitar. The first two measures the reverb is bypassed, then for the next two it’s got a short and bright setting with a .4 second decay time. The next two measures are bypassed again, and the last two have the reverb with a 1.0 second decay. On both, the Reflections knob is set at around 12 o’clock, and the predelay is about 20ms. Here it is on a full drum kit. The first two measures are bypassed, and then the reverb (an insert), kicks in with a medium plate preset with a decay of 1.7 seconds. The Reflections are at about 1 o’clock and the predelay is off. 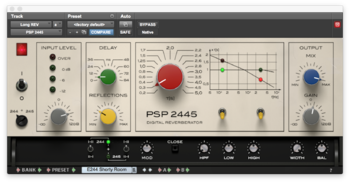 Finally, here the 2445 is inserted on the snare drum track of a multitrack kit. The reverb time is 2.4 seconds, the predelay 12 ms and the Reflections about 2:30. The differences between the algorithms are relatively subtle. The 245 seems a little bit brighter and crisper than the 244. Here’s an example with a snare drum, where the first four beats are the 244, the next four are the 245 and the last four are both together. Using the two engines in tandem sometimes yields a slightly richer sound, but again, the differences are rather subtle, as they are when changing the order of the two algorithms. The PSP 2445 ($149) is a quality reverb plug-in that you’ll be able to use for a wide range of reverb chores. It’s rich sounding, easy to adjust, and cleanly designed. I do wish it had a way to enter in predelay times numerically, and offered more presets, but overall, it’s an excellent and versatile reverb.